Humanity, the genus Homo, did well for 5 million years without God. Finding food, water, and surviving were good enough deities to get the genus Homo’s psychology by. But now we have individuals going around, proclaiming the absurdity of life (Camus and his ilk)… To find meaning, they need lions to show up, so they can think upright, and they don’t know it. They have become like sheep, as Christian propaganda insisted their were… whereas lions ran away from their distant ancestors. Running after lions was all the religion our ancestors needed, when they showed up. If humanity is so ferocious, and self reliant, why would humanity have ever needed gods? Men were the gods. Who needs gods? The difference is civilization, and, more precisely, its military aspect and the cancerous growth known as plutocracy. Catholicism was invented and imposed by emperor (“Saint”) Constantine, and his tyrannical successors (in Arabic: caliphs). In turn, Catholicism was the proximal cause of the military collapse of the Roman state, without any question. Islam was a bellicose ideology of Muhammad which enabled him to seize Arabia. Muhammad’s two immediate successors, companions and accomplices, Abu Bakr and Umar were immediately capable of building a gigantic empire, thanks to that immensely ferocious religion. They crushed the Persian and Roman empires, in a few years. Believers in Islam believe they sit with god after death, if they fight for Islam, or Muhammad. Our ancestors at work: no need for Gods to chase cats. The story there is that the cheetahs were hunting impalas next to a dam. 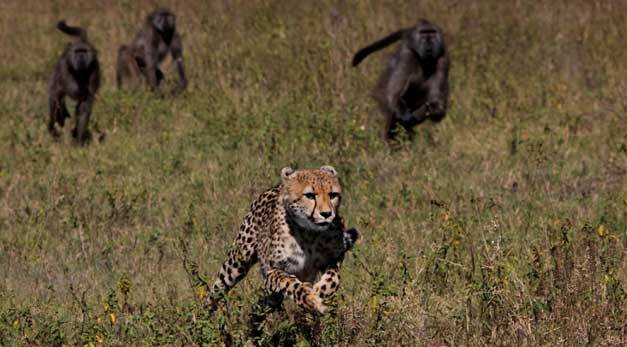 Jackals gave the alert, and baboons decided to encircle and then suddenly charge the cheetahs, to remove them from the premises…Baboons will act that way, even against lions. Our ancestors were expert at that, even 20 million years ago. I have met chimpanzees in lion territory with very few very small trees around, and they tried to frighten me (differently from the lions, who just went away). Those who think Catholicism didn’t bring the collapse of the Roman state should know the major facts (they don’t). It did, 100% (although the cause of Roman Catholicism itself was Roman military fascism, itself a consequence of plain old Roman financial fascism… for contemporary banks, see below). In particular Roman Catholicism was proximally causal in the fall of the empire, when the Occidental part of the empire was led by Frankish generalissimo Arbogast. Arbogast had long been emperor in all but name. His Frankish nature prevented him (at the time) to be elected to the Purple. The emperor Theodosius had established terror decrees against “heretics” since 380 CE. Those led to the devastation of the empire’s intelligence, culture, libraries, books, spirits, and intellectuals… Let alone the Jews and whoever Theodosius wanted killed. Arbogast tried to reestablish religious plurality, and civilizational sanity. So the Catholic fanatic, emperor Theodosius of the Oriental part, went to war. The mostly Frankish Roman army of the West got, barely, killed by Theodosius, thanks to a hurricane and the Goths, at the battle of the Frigidus river, September 5-6, 394 CE. Result? After Arbogast’s soldiers got killed at Frigidus, so was the Roman army in the West (although Germans were constantly attacking the Roman Germanias). Theodosius, sole emperor, died in 395 CE. Within six years, the government of bishops which by then led Rome, called onto (much less Romanized) Franks to protect the provinces of Gallia and the two Germanias; but in 406 CE, 12 years after the disaster at the Frigidus, Germanic nations broke through the Frankish curtain, and invaded the Western empire. In particular, the Vandals invaded all the way to Africa, et present day Tunisia. There they established a maritime empire, and blocked grain supplies to the gigantic city of Rome, and most of Italy. Rome fell to the Goths in 410 CE. Actually the king of the Goths, Aleric, had commanded the Gothic forces fighting the Romanized Franks at Frigidus. Small world: the eternal return of the same, just as bankers nowadays. The government of bishops viewed those who were not fanatically Catholic, and obedient as heretics to be destroyed. They didn’t just destroy independent individuals, but the entire Republican organization, by destroying culture, libraries, books full of (non-Catholic) wisdom. The destruction, by torture, of individuals such as Hypatia and major libraries, such as the one in Alexandria are examples of this situation. Less well known, is that the bishops forbade the death penalty. Thus highways were thereafter paralyzed by bandits: incarceration, besides slavery, was not possible in antiquity. Also plutocratic families (which often had a bishop) couldn’t be forced to pay taxes. Catholicism brought the collapse of the Roman empire in the West. The Franks, in the late Fifth Century, took over completely, and reestablished the situation by reimposing a modicum of tolerance, and then a lot of innovations. And, first of all, mandatory secular education between the Sixth and Eighth centuries (generally uniquely attributed to Charlemagne, erroneously, as the fighting against the Papacy was during the Sixth Century). This Frankish spirit of overture and advancing civilization was weaponized to conquer Europe. Main events: elimination of the Goths, 507 CE, final colonization and domestication of the Saxons by Charlemagne in a 30 year war, 800 CE; reconquest of Britain and Southern Italy, Sicily, late Eleventh Century. However, the conjugation of grievous Frankish civil war (Battle/massacre of Fontenoy) contemporaneous with multiple simultaneous deep invasions by Viking, Avars and Muslims, brought a disintegration of the empire. It’s not that the empire collapsed like the Assyrians in 614 BCE, or Nazi Germany in 1945. Instead, West Francia, exasperated by the military inefficiency of the empire, broke away from the rest, and then exploded in turn into around 60 states of diverse natures, through militaristic localization, also known as the Feudal Order. Great lords of the Eleventh Century were plutocrats who would have been without justification for except the violence of their military feats… if not for the heavenly justification of violence by the Bible. Hence Bible god came back: a resurgence of terroristic, mysogynistic and pedophiliac Catholicism, starting around 1026 CE (when an entire religious establishment of a French city was burned alive by the Papacy… Crusades followed, two generations later…). So “god” provided the metaphysical backup for degenerating Roman plutocracy and the Feudal Order. What about more modern times? Why were Americans so Christian “god” obsessed? The Bible is full of holocausts ordered by god, and king David is punished most horribly for refusing to destroy a nation: his son is tortured to death by god, over a week. God enabled to do what Constantine or Muhammad, and their successors did with it; kill one’s opponents, because god ordered it. Falling asleep while the bankers make deals with Hitler, Franco, and their ilk? Indeed! Once one has eliminated the Natives (as was done in the Americas and Australia), what is left of the need for god? Acquiring the mentalities of lambs! For modern Americans God became just a guarantee of perpetual infancy. The god-thing obsession? If we please a superior being, we will do better, s/he will take care of us. In other words, babyhood, all over again. Before the US Revolution, many Americans believed in a much more natural form of divinity. It turns out that, when a deity dictate what is right and wrong, it’s actually “The Man” who decides what is right or wrong. Now we have a more serious situation than pleasing The Man. In particular, bankers are in command of the planet: Clinton, and then Obama made sure of it. Their rewards were colossal, and much appreciated by their tiny mind. However, the times for gravitas has come. Jacques Attali, who is in very good position to know about bankers (he headed a totally major European bank, among many high level positions he had), warns us that a financial calamity, just like the preceding one, is around the corner. Attali says the bankers are back to industrial sized evil, worse than 2008. Why are the bankers back to their nefarious ways? In part because Obama would finish all his discourses, certifying, like G. W. Bush, or Clinton, that “God bless America”. So the US lambs were satisfied, and have been bleating contently ever since. Their bankers’ boy, Obama, was excellent, as the color of his skin testified, they said, with characteristic, we-believe-in-bible-god psychology. (Ex-Harvard law professor) Senator Elizabeth Warren is running for president. To my surprised amazement, she rolled out her financial program last week: she proposes enormous taxes on the super wealthy. 2% of wealth above 50 millions, and even more, higher up. Senator Warren’s wealth tax would be the way I would implement limiting wealth absolutely. For Americans to graduate from infancy, they need to reject “god” and go back to their revolutionary roots… which were decidedly secular, we have that secularism in writing, from the most official documents by the US Founding Fathers… Philosophical infancy was nice, but it’s all over, the lions of fate are onto us now.